Of the myriad of films I have viewed in my years attending the Toronto Film Festival, “Out of Blue” is by far the worst. It goes beyond bad acting, an uneven screenplay and a low-quality production. Director Carol Morley has essentially transformed a low budget television episode into a disproportional murder mystery. Honestly, I’ve seen episodes of “The X-Files” with higher production value than what’s presented here. 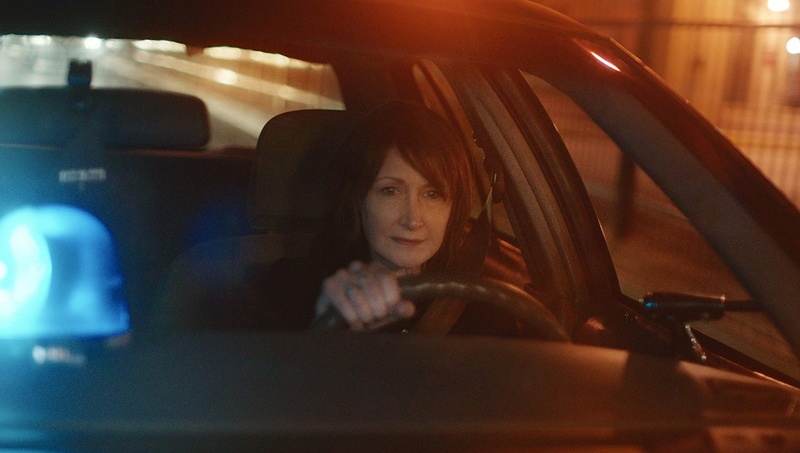 I love Patricia Clarkson (“Pieces of April,” “Lars and The Real Girl”), just appearance elevates a film to the next level. So how can a film with the “House of Cards” star in the lead go this horribly wrong? Known as the “case closing legend,” Detective Mike Hoolihan (Clarkson) plays things cool in whatever situation she’s in. She’s spent her entire adult life in the New Orleans Police Department. She’s also a recovering alcoholic with internal demons, but who isn’t in that city? Her latest case involves a young woman who was apparently murdered outside a space observatory. She’s the daughter of a prominent local businessman and war hero. Hoolihan’s partner suspects a resurgence of the unsolved .38 caliber serial killer who was never caught. Hoolihan is leaning in a different direction when she isn’t suffering from her own personal flashbacks, that seem to be brought on by this case. "Clarkson’s Hoolihan lacks humor, which of course is funny thanks to the way she delivers." A few times throughout the film, Clarkson’s Hoolihan lacks humor, which of course is funny thanks to the way she delivers. These moments seem to hint at deeper character traits that are never explored, beyond a few digs about her masculine wardrobe. Clarkson plays the character in a way that comes across as more disinterested than simply being guarded. Maybe Clarkson’s performance is awry because Morely can’t decide if “Out of Blue” is supposed to be a satire, mildly sci-fi or some other genre offshoot, but it fails on every front. The story tries to encompass far too many eccentric characters and subplots, none of which are interesting. Making matters much worse, Gummer’s space babble narration is unnerving and disinteresting. Perhaps Morely is aiming for something like Christopher Nolan’s “Insomnia,” but what she lands here is just bad on every level. At times Hoolihan feels like someone we are supposed to already know from some other episodic adventure, reinforcing the idea of putting the audience in the middle of a moving puzzle. The plot becomes so absurd with its twists and turns that the viewer is left entirely confused. Many people left before this one was over rather than watch this train wreck play out to its ridiculous conclusion. “Out of Blue” is a noir genre disaster and an unfortunate misfire for Clarkson.